If you haven't been paying attention to the #OwnVoices movement on social media, it's time to sit up and take notice. This is something that I have become more and more cognizant about lately - the need to read not only diverse books but diverse books written by folks from that diverse community (i.e. books with African American characters written by African Americans, books with disabled characters written by people with disabilities, etc.). Kayla Whaley has an excellent essay about why #OwnVoices titles matter and you should definitely start there if this is the first time you're seeing this hashtag. For a long time, I felt satisfied with my reading if I was making sure to include books featuring diverse characters, but now I make sure to dig a little deeper and take note of who is writing the story. This is not to say that people can't write well outside of their own culture, but I'm now keeping track and making sure that I'm including plenty of #OwnVoices in my own reading. And you know what? This is not solely for my work (though that is reason enough), but for my own edification and enjoyment. One practice that helps me read inclusively and pick up #OwnVoices titles is to surround myself with them. I make sure that my bedside table has #OwnVoices titles on it at all times. When I receive books from publishers or peruse catalogs and reviews for collection development, I make note of the #OwnVoices titles. I load my Kindle up from NetGalley and Edelweiss. I surround myself with diverse #OwnVoices books so that when I'm ready to pick up something new, I have lots of choices at the ready. This means that when I pick up books or hear about books, I'm doing a little research about the author. It's something that started as something I had to really think about, but it's now become automatic. Looking for a place to start with #OwnVoices titles? Check out the Twitter hashtag #OwnVoices, plus here are a handful that I have read and enjoyed recently. Please share your favorites in the comments! 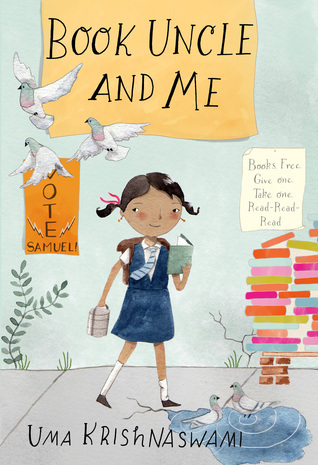 Book Uncle and Me by Uma Krishnaswami, illustrated by Julianna Swaney. Grades 3-5. Groundwood Books, 2016. 149 pages. Review copy provided by my local library. Yasmin loves her "Book Uncle", the man who runs a small leave-one, take-one book lending library on the street outside her apartment building. But when the town's mayor requires Book Uncle to pay for an expensive permit to run his library, the book stall may be shut down for good. Yasmin and her friends decide to get involved in the upcoming mayoral election to see if they can save their beloved books. This is not only a great book for kids who like to read, but it's a great story about civic engagement. 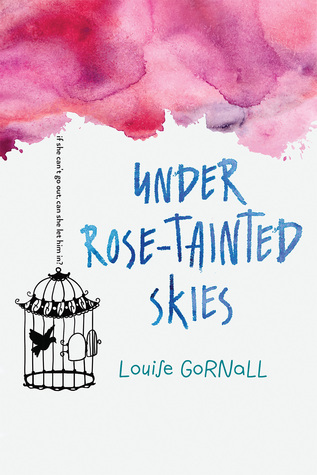 Under Rose-Tainted Skies by Louise Gornall. Grades 9 and up. Clarion Books, January 2017. 320 pages. Review copy provided by publisher. Norah never leaves her house. She has agoraphobia and OCD, so she lives within the walls of her house, going to school online, sometimes leaving her home for therapy when she can manage it. But when a new boy moves in next door, Norah finds herself checking him out. And when he actually seems to like her (through the window and from the doorjamb), she starts to think about letting him in. But is she too crazy for a relationship? In a letter in the front of the ARC, author Louise Gornall explains that this book started when she sat down one day to write about how things feel to her. This book puts you right into Norah's head so the reader can see how Norah's thoughts often spiral out of control. 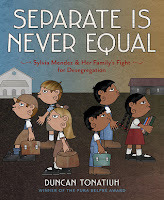 Separate is Never Equal: Sylvia Mendez and her Family's Fight for Desegregation by Duncan Tonatiuh. Grades 3-6. Abrams, 2014. Review copy provided by my local library. This impressive book conveys a lot of big ideas in relatively simple language, just right for its child audience. When Sylvia Mendez's aunt went to register her and her brothers for the local public school in California in the 1940s, they were told that the children would have to attend the Mexican school. The separate "Mexican" school was in a run-down building with very few resources and teachers that expected kids to drop out by 8th grade. 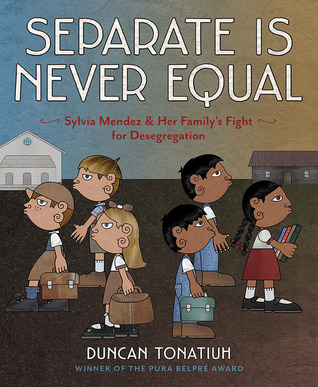 The Mendez family decided to fight school segregation and seven years before Brown Vs. Board of Education, they won the right to desegregate their schools. 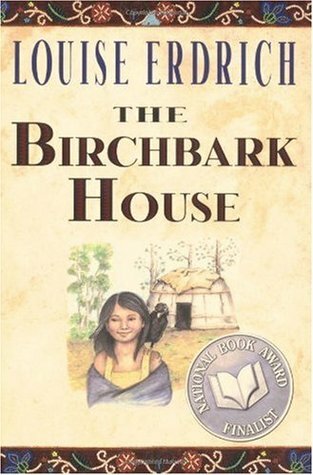 The Birchbark House by Louise Erdrich. Grades 2-6. Disney Hyperion, 1999. Review copy provided by my local library. The story of Omakayas, an Ojibwe girl growing up in a village in the woods, is a must-read for fans of Little House on the Prairie. It's loosely plotted, taking the reader through a year in Omakayas's life. Readers who like learning about how people did stuff "way back when" will really dig this - all the details about how Omakayas and her family built their shelters, found and stored food, etc. make for a really interesting story. Press this into the hands of all your young Little House fans to give them a different and important perspective. 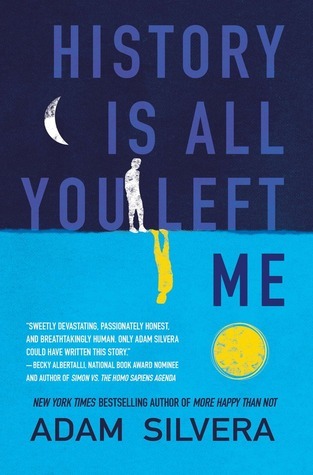 History is All You Left Me by Adam Silvera. Grades 9 and up. Soho Teen, January 2017. 320 pages. E-galley provided via Edelweiss. Oh man, remember that feeling of first being in love and how crushed you were when it ended? Yeah, be prepared to relive that here. Griffin has not only broken up with his first love Theo when Theo decided to move across the country for school, but now Theo has died. And Griffin is trying to deal with that and it feels impossible and his OCD isn't helping anything. If you're in the mood for a raw, real love story or if you know any teens who are suffering through their first heartbreak and wondering how they'll ever recover, this is the book. What other #OwnVoices books would you recommend? ?